The permeability of a woven structure allows for a significant reduction in the weight compared to the corresponding impermeable structures . An example of this is in Thysanoptera (Thrips): the wings of these mm-sized insects are not membranous like conventional wings, but are comb-like. Incredibly, the lift generated by these comb-like wings is approximately the same as that which a conventional wing generates. However, since very little material is required for these wings, massive gains in lift to weight ratio are achieved . One might expect that the drag force on a permeable structure is always less than the drag force experienced by the corresponding imprevious structure. Intrigingly, numerous studies have found that the drag force of impermeable structures can be higher than the corresponding impervious structures [3, 4]. For example, three distinct behaviours are identified in . In the limit of very low permeability, the drag coefficient approaches that for a solid body, as expected. In the limit of very high permeability, the computed drag coefficient asymptotically approaches zero, a phenomenon that is predicted analytically. Between these two extremes in permeability, however, an increase in drag of up to 50% over that for a solid cylinder is observed. This project aims to design micro decelerators (see inset, redrawn from ) that can change their permeability to enhance their drag coefficient over the corresponding impervious structure. It will involve numerical and physical modelling. In particular, we will fabricate woven decelerators for a range of permeabilities, and examine the air ow around the structure using Edinburgh's vertical wind tunnel. We will develop a numerical model, which will compute the flow through and around the pervious structure. Zussman, E., Yarin, A., Weihs, D., 2002. 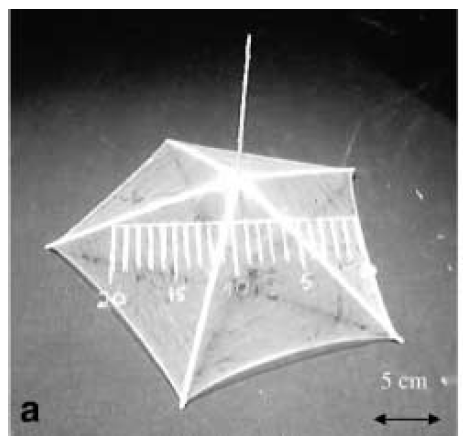 A micro-aerodynamic decelerator based on permeable surfaces of nanofiber mats. Experiments in Fluids 33 (2), 315-320. Barta, E.,Weihs, D., 2006. Creeping ow around a finite row of slender bodies in close proximity. Journal of Fluid Mechanics 551, 1-17. Masliyah, J. H., Polikar, M., 1980. Terminal velocity of porous spheres. The Canadian Journal of Chemical Engineering 58 (3), 299-302. Noymer, P. D., Glicksman, L. R., Devendran, A., 1998. Drag on a permeable cylinder in steady flow at moderate Reynolds numbers. Chemical engineering science 53 (16), 2859-2869.